WildCat Stadium is one of the nicest venues in the conference, as the majestic Blue Ridge Mountains serve as a backdrop as you view it from at the top of the hill. From the track and field, players are surrounded by trees and a 30-foot retaining wall, giving it a "colosseum" feel. Fans are elevated above the action for a great aerial view of play. Railings and hills on each side of the field also allow for non-traditional seating for fans of all ages. 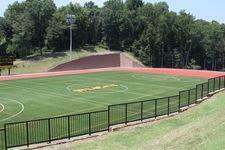 The field also plays host to Randolph College's Summer Soccer League, and has hosted multiple VHSL and Virginia Private League lacrosse matches. It was also the site for the regional track and field meet in 2012. WildCat Stadium played host to the 2011 Old Dominion Athletic Conference Men's Soccer Championship, which saw Randolph defeat Lynchburg College 2-1.